Where Does the Equipment Come From? Dometek does business all over the globe and also sources equipment globally. Our extensive network of current and past customers and distributors, suppliers of new machines and also financial institutions assist us in finding “interesting” machines. The equipment can come from either Europe or North America. 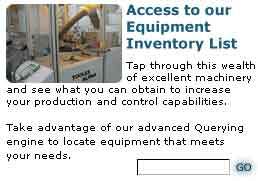 There are a multitude of reasons why equipment is sold. Plants with limited space are updating their equipment inventory to smaller systems, company mergers lead to standardization and thus to surplus equipment, equipment becomes available when lease contracts expire, or companies go out of business altogether. Every piece of equipment is thoroughly inspected before we purchase it. However, not all equipment that we purchase will be refurbished. In many cases equipment in below average condition will be completely scrapped and only valuable components in good condition will be kept for spare parts support. Only equipment in above average condition will be slated for complete refurbishment. Once refurbished this equipment will pass stringent acceptance test conditions and these standards allow Dometek to offer the most generous warranty for pre-owned machinery industry-wide.